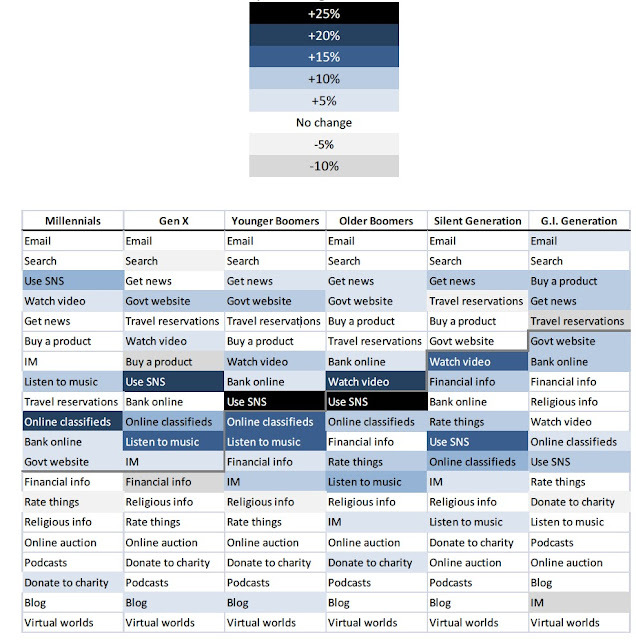 According to the latest Pew Generations Report, virtual worlds have less participants than any other online niche surveyed and are experiencing no growth. It's pretty pathetic. Virtual worlds were not just trounced by social networks and multimedia viewing, but even by religious information sites and online auctions. After seven years in the public eye, it's clear that neither incremental technology improvements nor new ad campaigns are going to dramatically increase the virtual world market in the foreseeable future. After reading the report, I'm more convinced than ever that browser-based access to virtual worlds in conjunction with social network integration is the most credible light at the end of the tunnel. The way to move virtual worlds from their current isolated backwater into the integrated mainstream is by making them as seamlessly accessible and usable as every other category in the Pew Report. This will also require mobile-compatible clients, since mobile internet use will surpass computer-based use within the next few years. As much as we love to hate Farmville, its success proves that typical Facebook users will flock to virtual environments that are embedded within their social networking experience. But they're not going to download and install a heavy-weight client. And they're not going to care about the 75% of the current functionality cluttering the UI that is outside the basic chat/play paradigm. It's likely that most people will just want to pop in for 3D chat, a fast social game or a live event. I am NOT advocating getting rid of heavyweight clients or changing the user experience for the joyously immersed, or any solution that requires public association of an account with a human identity. My future vision is of a multi-client universe where users can access virtual worlds through a wide range of applications and devices. Although browser-based users could access any place on the grid, there would be special sims tailored to games, events, etc. optimized for the Facebook crowd or mobile users who may have limited functionality or bandwidth. I think this multi-dimensional paradigm would offer a great opportunity for community scripters, builders and entrepreneurs to reach a vastly greater market, perhaps one that is integrated with Facebook's payment system. Finally, I think that OpenSim Hypergrid technology (or something like it) is the way ahead for those of us who want to continue to push forward the old-school Full Monty experience. An integrated system of grids owned by small businesses, non-profits and private individuals will not have the kind of financial pressures that necessitate the kind of growth that investors in venture-backed companies demand. Time will tell! 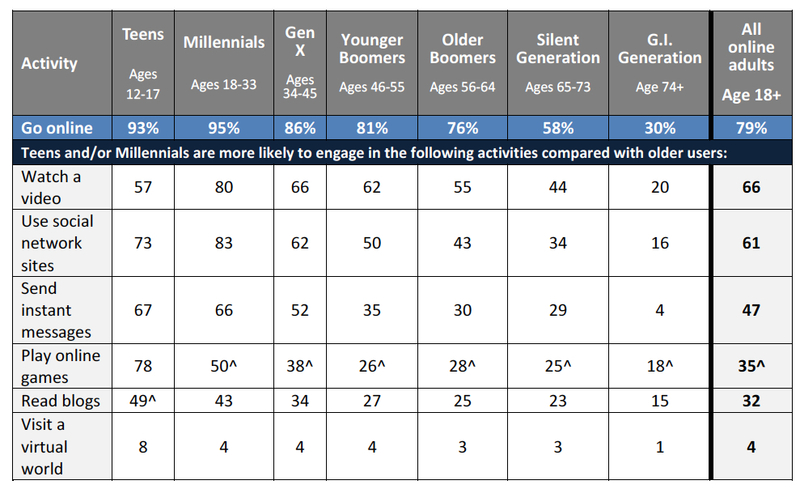 For now, here are a couple of tables from the Pew Generations 2000 Report. Grab a copy yourself. It's a free download and well worth a read. Excellent post. Your suggestion of a "hybrid solution" is the perfect evolution for virtual worlds. To attract the next level, beyond the early adopters - there has to be that tie to the physical world. Full immersion is too much for most. A vehicle that would allow a person to "ease into it" would attract more followers. I'm case in point. I have just recently been exposed to Second Life, and only because of my work with loyalty programs and gamification. I signed up ... and then it seemed overwhelming. "Going in Full Monty," was too much of a mindspace commitment. I called my 21 year old daughter, who works for Apple, about Second Life. She said she checked into it four years ago, but couldn't allocate the time to really get into it, to the level she wanted. I'm sure she is not an isolated case. But, to connect the virtual world with our physical day to day existence and routines could be an effective and integrated way to manage our lives. I'm not just looking at entertainment and consumption, but also more charitable activities. It could be a way to "get out of the trees" to see the entire forest ... the comprehensive picture of our lives. You do that - then the game's on. Yes I agree. A mix between web and client based vw is the solution. we who want to build and create stuff download the client. Them who just wanna chat or go to event, they just pop in via web browser. It's all about a lack of marketing and channel sales program! When was the last time you saw an externally-facing Second Life marketing campaign? What compelling call to action do you remember it having? If you're a architect, engineer, teacher*, trainer or small business with remote sales/support staff, etc., have you ever had a Value Added Reseller (VAR) call on you and show you how Virtual Worlds like Second Life or OpenSim can be used to improve team synergy, increase creativity or improve training outcomes? How about using Virtual Worlds as a medium for creating compelling customer-facing marketing, sales, training or customer support content? Businesses, and yes, even non-profits and educational institutions, need to be able to justify (ROI) their use of Virtual World environments. Individuals also go through a mental justification for how they spend their time and money. Creating a mental value picture is what marketing is designed to do! Helping the Small to Medium-size Business (SMB) market justify the value of a particular technology for their specific needs has long been the domain of Value Added Resellers! Individual users increasingly make this value decision based on the Social Web (Viral Marketing). Until Virtual World companies, including Second Life, develop and deploy effective Marketing and Sales Channel programs, there will be no significant growth in this segment of Inter-web application usage! The number one response I get from people after describing second life and the metaverse to them is: "sounds cool, wish I had the time." It's not called second life for nothing. But your conclusion of a happy coexistence between the web based user, and the client based content creator, is right on the mark Botgirl. And not just for all the virtual farmers out there, but I see 3D content creeping into everyday use in ways not yet thought of. I see getting a default avatar with every google account just so you can go shopping online, as an option. Remember that avatars don't carry the same stigmas with the digital natives as they do with my generation, so what I'm saying is, anyone skilled in creating virtual content (or rl content reproduced digitally) will be in as much demand as web designers and HTML programmers were during the early days of the web. - A Second Life music venue could have a Facebook page and post events. Fans of the musicians (real and virtual) could sign up and attend right from their browser. - A virtual pet company could create a sim with apartments, basic furnishings and pets . . . or a farm with breeding, riding, etc. Again, it could be positioned just like any other Facebook game. I think the long term benefit of this "toe in the water" approach will also increase the immersive virtual world market over time. Very informative! Yeah, I think a web-based app is probably a requirement. Since music and video is such a big draw, I believe you are right that this could be viewed as an opportunity. In particular, I'm thinking about performances by tribute bands, these are getting better and better. How about a technology that provides a video view of concerts? SL based viewer avs (avs that are used to "see" but not physiall interact) could be placed at concerts and used to broadcast like television to the web-based app. Audiences could see the goings on, and participate thru IM and chat perhaps. Perhaps this already been throught thru? Thanks Yordie! I've often wondered why bands down stream live video concerts into Second Life. It seems like that would be the best of both worlds. See the people playing and singing, while being able to mingle and chat within the 3D space. One reason may be that it's currently a lot easer to stream high quality audio than video. 2. 57% of teens "watch a video" online? Somehow I'm thinking these numbers are off. A lot. That number should be like, 99.8%. 3. 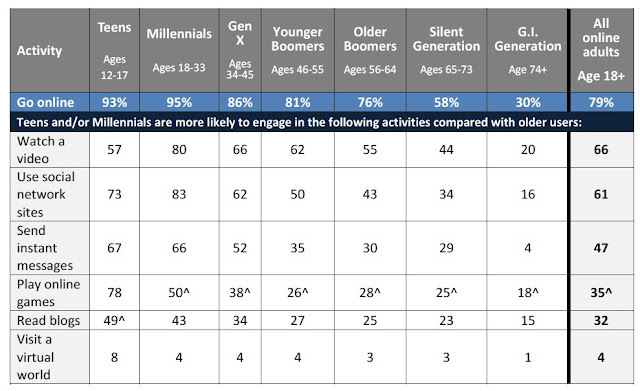 Millenials are defined as "18-33". That's quite a stretch for a single generation. 4. It's only the second year of the survey. However, I tend to agree with your suggestions, despite the survey. I think browsers should be gateways into virtual worlds, I think virtual worlds need to integrate with social media, and I think the lines between all of these categories that PEW tries to pigeonhole are already blurred and blurring further. We need to be exploring more alternatives. And I think some of the problems with the current state of virtual worlds revolves around the tendency for over-enthusiastic folks to think that a particular platform is ideal for *all* use cases. When you're very excited about your shiny hammer, everything looks like a nail. Hiro: I wondered about how they sliced and diced the categories too. I also agree that trying to pigeon-hole everything into is problematic, because many services would fit in multiple categories. Nevertheless, I think the numbers are so low, that it's safe to say that virtual worlds have exceptionally low penetration compared to other area. becunningandfulloftricks.com: - if that is your real name :) -I just gave jibe another try the other day. I'm really looking forward to the mobile toolkit that's mentioned and hope someone is busily working on an Apple store release. I agree with you about keeping our minds open and exploring alternatives. I think some of that depends on why you're interested in virtual worlds. Are you in the business or use them as a market for your goods or services? Are you embedded in a virtual world community? Are you just a big geek? And so on. Re: Finally, I think that OpenSim Hypergrid technology (or something like it) is the way ahead for those of us who want to continue to push forward the old-school Full Monty experience. An integrated system of grids owned by small businesses, non-profits and private individuals will not have the kind of financial pressures that necessitate the kind of growth that investors in venture-backed companies demand. This is what I'm going to dub "a nation of hop-keepers" -- people establishing grooves of hopping around grids like Pathfinders little hop parties. The problem is that you pretend that small business and the Dole from universities or foundation can sustain this "hypergrid" -- and you also pretend that big IT isn't in fact floating around it -- Microsoft, Intel, IBM are all nosing around OpenSim doing various things. There's no reason why Second Life can't be that sustained virtual entity that doesn't feel the financial pressures if it is indeed true what the Lindens are telling us that it makes a profit. What's needed here are not browsers or marketing or new technology. What's needed is for the pioneer Lindens to get out of the way of their creation and for their early, hobbing ideologies to be hedged away from new growth that will definitely be about commerce, mass culture, whatever it takes naturally, however things grow when you don't artificially hobble them by strange California hippie ideas like having ad farms so as to promote "creativity on my land" or have traffic bots because "we never met a script we didn't like" or not allowing ads in the welcome areas because "we can't have crass commercialization, the oldbies hate it" -- although of course, we can have it on the midbies property views for "creativity" purposes. And so on and so forth, all the hobbling, destructive notions that stopped growth. Entry isn't that hard to SL -- unless you're trying to use entry as a political tool to force the hacker culture of scripting, building, vehicle driving on people. It's funny how many new people come and use even the viewer 2.x we all denounce and come and rent properties and spent money within 7 days. I see it all the time, and welcome it. There needs to be more, one thing of course that went wrong was the crippling of Search (that was a Google ideological hobble). As I tweeted to Tim Berners-Lee the other day, and and his pals need to let go of the Internet, it doesn't belong to them anymore. Prokofy: I get the sense that there are enough committed OpenSim-based ventures to keep things going for the foreseeable future. I agree with you that there are corporate players floating around, which I think is a good thing. I'm not against venture-funded and Fortune 500 organizations (my blog is hosted by a Google-owned platform, for instance), I just think it's good for the overall virtual ecosystem to have healthy, thriving alternatives. I agree with you that Linden Lab has shot themselves in the foot many times with bad governance decisions. But I don't think that's the main reason that virtual worlds have such a tiny user-base compared to the other categories itemized in the survey. The vast majority of potential customers never even registered, so are unaware of such things. It seems to me that it would revolutionize the virtual world paradigm if anyone with a browser could enter one with a couple of mouse clicks and be presented with a clear and compelling use case, such as attending a concert, chatting with a Facebook friend or playing a game.